The file Battle of Gariglano v.23082018 is a modification for Medieval II: Total War - Kingdoms, a(n) strategy game. Download for free. Battle of Gariglano is a mod for Medieval II: Total War - Kingdoms, created by La_Bayard_95. Gariglano 1503, the rode to the crown of Napels. The towns' deafenders consist of Spaniards and 2,000 Landskencht send from Emporer Maximilan. The French must rush the town before they are sluatered or make a timely reteat, on the other hand the garrison must hold untill there comrades come. During the night between 27 and 28 December, the Spanish brought the bridging materials to a place near the castle of Suio, in a position invisible to the French, some six kilometers north of the latter's camp. D'Alviano, commander of the Spanish vanguard, had the construction begin at dawn. By 10 AM some 4,000 Spaniards had crossed the Garigliano. The 300 Norman crossbowmen in Suio did not notice the move, so Gonzalo de Cordoba was also able to cross the river with 2,000 more, including 200 horsemen led by Prospero Colonna. He then ordered an attack on the French bridge. 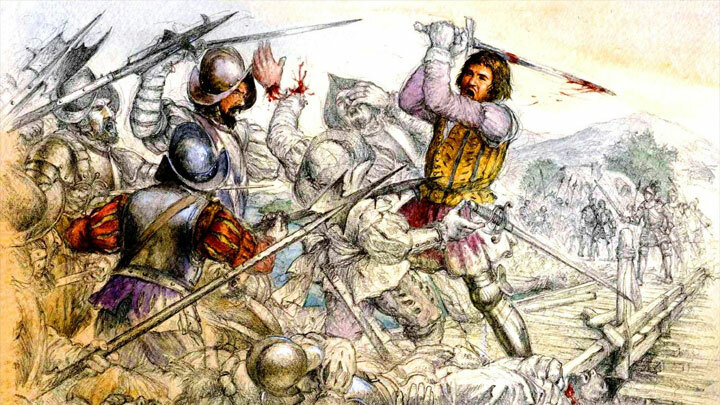 When d'Alviano's troops reached Suio, the crossbowmen fled towards Castelforte, where they met 300 French troops. These also fled to Traetto, allowing d'Alviano to occupy Castelforte. Gonzalo de Cordoba spent the night in that town. The French had numerous ill soldiers in their Traetto camp, so they were unable to send reinforcements. French captain Alegri then decided to destroy the bridge and to order a general retreat to Gaeta, abandoning all the sick soldiers and nine cannons in the camp. Informed about the French retreat, Gonzalo decided to continue the advance. Colonna and his horsemen made contact with the French at Scauri, but a courageous defence of a bridge by Chevalier Bayard allowed the French a safe retreat. After a series of minor clashes, the French took position near a bridge in Mola where they were able to push back Colonna's attempt to surround them. However, the arrival of the rest of the Spanish forced the Marquis of Saluzzo to order another retreat. This mod is a part of Battles That Made Today project, attempting to recreate famous and interesting clashes from Medieval and Renaissance period.